Every two weeks, The Next Web helps you keep track of interesting technology events around the globe, by updating our list of upcoming tech conferences, meetups & get-togethers. As the end of the year approaches, you might be interested in attending a few of these global events. For most of these events we’ve arranged a special discount. If you think your event should be included feel free to submit it for review. * denotes events organised by The Next Web. From the 1st until the 4th of December 2012 at the Kings of Code Festival, 450 developers from around the world will gather in the centre of Amsterdam. See leading international speakers discuss the latest trends, developments and best practices in web and mobile development technologies. Are you a hacker? Join us for the Hack Battle in the weekend prior to the conference to hack on cool API’s and SDK’s. Grab the last early bird tickets before they sell out! Expect the 8th edition of The Next Web Conference to be packed with amazing speakers, high quality content, networking events, parties and dealmaking opportunities. On April 25th & 26th we’re expecting 2000 attendees in Amsterdam to join us in raising the bar for every technology conference in the world. The attendees are a blend of decision makers from the European & American tech scene, developers, start-ups, innovators, along with venture capitalists, industry journalist, bloggers, and senior level executives. Future of Web Design returns to NYC this October for 3 days with the most creative and exciting minds in web design and development. FOWD kicks off with two days of sessions on Responsive Web Design, Typography, Accessibility, Icons, HTML5, CSS3 and much more. Join us for amazing networking opportunities, great food, a free party and a few surprises thrown into the mix for good measure. We’ll wrap things up with your choice of four different, day-long workshops, each lead by a totally inspirational industry leader. TNW Readers can save 15% by using discount code “TNW15″ here. CrowdConf 2012, hosted by CrowdFlower, is the first and leading conference on crowdsourcing and the future of distributed work. Join an international audience of more than 500 execs, scholars, investors, entrepreneurs, and data heads at the 3rd annual crowdsourcing conference. CrowdConf will feature presentations, panel discussions and smaller breakout discussions in three tracks, as well as a lively expo hall full of exhibitors and sponsors. Keep current on the latest trends, research and real-world applications in crowdsourcing. TNW Readers can save 25% directly here. Join leading startup entrepreneurs, venture capitalists and successful business leaders from the U.S. and Russia at the inaugural Russian Innovation Week Conference on Oct. 25 – 26, 2012 at the Computer History Museum in Mountain View, CA. Meet Russian innovators and startups in search of their perfect investment partner, explore up-and-coming developments in the fields of clean-tech, bio-tech, pharmaceuticals, the life sciences, nanotechnology and IT, and mingle with your new business contacts at evening networking receptions and keynote dinners. Register using code ‘RIWTNB12’ here for 1/10 conference invitations. The flagship information security conference series of EC-Council, with its objective being to raise awareness towards increased education and ethics in Information Security. Since 2004, Hacker Halted has been organized in world-class cities such as Miami, Dubai, Kuala Lumpur, Singapore, Taipei, Guangzhou, Cairo, etc. Hacker | Halted by EC-Council will be the iteration of the globally successful series of academies and conferences, created solely with the emphasis to equip security professionals with the latest tools and know-how to ensure the integrity of our security system from malicious attacks. Hacking for Good? Hacking for Innovation? Yes, it’s not hacking the Pentagon or MI6… To the contrary – creatives, developers, coders, and entrepreneurs get together, get creative and get to build cool stuff for TV during TV Hackfest London. In partnership with London Transmedia Fest 2012 event on the 26th & 27th October, organised by the BBC Writers Room, Ogilvy Labs, Portal Entertainment, DMIC project, the EDRF, Greenwich Digital Peninsula, Oxford University Said Business School, Young Rewired State, Appmarket.tv and Agora Media, it will be held at London’s Ravensbourne College in London. On the 30th-31st of October, the Hofburg Imperial palace will open its doors to 2500 visitors and host two tracks: The startup academy with the best mentors in the world and the trailblazers track for the big discussions and inspiration with speakers like Adam Cheyer (the father of Siri), WordPress Founder Matt Mullenweg and influential Venture Capitalist and Backup Cosmonaut Esther Dyson. At the Startup Challenge (last year the 7 best teams got investments between. 500K and 2,2M from YC, VCs and Business Angels), 50 hand-picked ones get to spend a day prior to the conference days solely with investors; check out the 50 start-ups selected out of more then 850 applications. 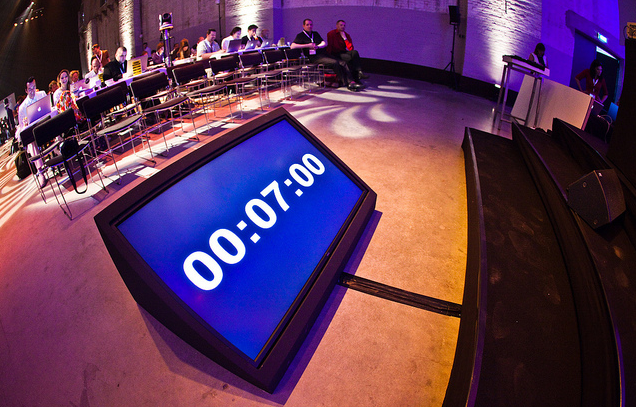 The final eight get to pitch to the big audience and the winner takes home 25K as the prize. Grab the last tickets for the Pioneers Festival here. Decoded Fashion London presents curated discussions and new content that bridges fashion and technology to accelerate innovation at the intersection of fashion and retail. We blend disparate industries—startups, designers, developers, media professionals, and investors—with the goal of fostering valuable partnerships. We are here as your intelligence source for technologies that revolutionize fashion and retail. Our TNW editors will be here, make sure you meet them! TNW Readers can save $20 using code ‘TNWDecoded12’ here. The convergence of social media, mobile connectivity and payments technology is changing the way we interact, live and shop. Meet and interact with thought leaders, experts and innovators in the social, mobile and payments ecosystems. Participate, share your findings with your peers, meet like-minded individuals and explore your passions. Shoppers check-in and check-out with their mobile devices, telling their network, family and friends about their finds and fails. Social Mobile Payments: Americas will explore the forces that are changing the way today’s consumers interact, live and shop in Generation-M! TNW Readers can save $100 using code “DELEGATE” here. How to Web is the most important conference on web business and technology in South-Eastern Europe, putting together more than 800 leading innovators, entrepreneurs and professionals for a feast of hands-on talks on global web trends, product & business innovation and new technologies. During How to Web we organize the Startup Spotlight program & competition, showcasing some of the most innovative startups in Central & Eastern Europe, along with world-class accelerators, investors and support programs. Co-founder Patrick will also be speaking at this conference, if you want to meet up with him just drop a tweet! TNW Readers can save 15% using code ‘TNWGOES2HTW’ here. Mexico Investors Forum 2012 is Mexico’s largest investor event. More than three hundred delegates will be attending. Speakers currently include former Mexican President Vicente Fox, Deputy Governor of the Bank of Mexico Manuel Sanchez, and Chief Investment Officers from three of the AFOREs. This forum will bring together investors, fund managers, and advisors to discuss both traditional and alternative investments. TNW Readers can save 20% using code “LM20” here. The Smartphone & Tablet Games Summit London is a full-day conference focused on the emerging smartphone and tablet games space. As the power and revenue of the industry continues to shift from retail to instant downloadable delivery, the rise of smartphones and tablets has ushered in a true renaissance in gaming. The summit will touch on a number of key trends including:, Customer Acquisition and Distribution: Facebook and Beyond, Mobile App Metrics for Success, Colliding Worlds: Real & Virtual Currency Gambling, and Monetizing Apps in a Saturated Social Environment. TNW Readers can save 15% using code ‘TNW15’ here. The third annual London Social Gaming Summit is a conference focused on the intersection of mobile gaming, immersive worlds, real-life brands and social networking. The Social Gaming Summit unites established industry leaders along with emerging start-ups in free-to-play games, real money and credit based gaming in the social space, virtual goods and payments infrastructure for one full day of illuminating keynotes, lively panels and engaging discussion on the convergence of gaming and the social web. Under the Radar has been recognized as the most important showcase of innovation in Silicon Valley. Why Attend? Connect with over 300 executives from leading brands and businesses, learn about the latest technology that’s disrupting the way business is done, meet face to face with innovators and thought leaders and hear where buyers of technology are placing their bets. TNW Readers can save $200 directly here. For all developers, designers, ideas people interested in hacking Mobile apps for any platform! Whether you’re already looking to build an app of your own, or looking to explore the mobile app space, there’s no better place than this weekend! Mentors will be on hand to help throughout the weekend, workshops will help you get to grips with new skills, tools & techniques. Join in and make the most of this great opportunity! TNW Readers can save 25% using code “TNW” here. Mining companies are increasingly looking to in to technology solutions to manage increasing complexities of day-to-day operations and boost operational efficiency. However mining companies have conservative approach towards investing in development of IT infrastructure and understanding the progressive need of having IT-centric operations. Even though mining companies are investing in Information technology and development, there are key concern areas that need to be addressed. This conference aims to address majority of these issues and facilitate this industry as a whole. TNW Readers can save 15% by e-mailing the event organizers. Future of Web Design comes to Prague for the first time ever! Our shows always attract lots of fantastic web designers and front end developers from mainland Europe, so we decided to bring the show out to you this year. FOWD starts with four different, day-long workshops. Next, we have two full days of conference sessions, with talks from some of the best minds in web design and development. We’re also teaming up with our sister show Future of Web Apps, giving you access to twice the content. nextMEDIA is Canada’s most influential and forward-thinking community of executive-level media professionals working in the digital space. By bringing together the leading international players, platforms, services and consultants disrupting the media landscape in the areas of advertising, media and publishing, nextMEDIA is where the old school and new school collide. Culminating with Canada’s only national digital media awards show – The Digi Awards – nextMEDIA also offers a must-attend event taking place Dec. 3-4 at the Carlu in downtown Toronto for anyone looking to get ahead in digital media. TNW Readers can discounted tickets at $545 by using code “TNW” here. With three targeted content focuses, SocialPLAY will give you all the necessary insights to bring the world of gaming to your business. Join, network and learn with a global community of developers, brands and licensers. Explore the vast potential of the social, casual and mobile games space across two days of innovative content. Investigate the very latest strategies with our international speaker faculty and enjoy engaging networking opportunities with them throughout the conference. TNW Readers can save 10% by using code “YRSB” here. There are 1000s of influencing factors that are shaping tomorrow’s consumer trends everyday – some small, some big, some that will never last and some that are here to stay. Trends Plus will give you a unique opportunity to explore and gain a 360° view on a well-balanced blend of trends and ideas that are actively shaping your future consumers. With heaps of forward thinking and a wealth of visionary ideas, you are bound to leave this event in-the-know and inspired! TNW Readers can save 10% by quoting “TNW” here. Ready to Inspire is a brand new and conference about the craft of web design, type and code. It has workshops, live music, meetups and parties, but above all an exciting lineup of today’s craftspeople and mind-blowing new faces. Fuel your brain with awesomeness and ignite your creativity. Make powerful connections and enjoy all the great things this event will offer you. Inspire’ main lineup presents Jeffrey Zeldman, Simon Collison, Tim Brown, Shelly Bowen, Brad Frost, Matt Brown, Cindy Chastain, Derek Featherstone and Chris Shiflett. TNW Readers can save 10% by quoting “INSPIRE10TNW” here. Should you throw out the Customer Loyalty playbook? In the year of customer loyalty program renovation, the Customer Loyalty Marketing Summit is your one-stop for all of the latest trends, technologies, and approaches for engaging and retaining customers. Join IQPC as we highlight the most successful emerging trends in loyalty programs and learn how to build a relationship with your customers that will not only drive higher profits, but lead to that will transform point-of-purchase interaction and long-term customer engagement. LatinComm is collocated with ITEXPO East and is THE event to help you capitalize on the tremendous communications and technology opportunities in Latin America and the Caribbean. It is designed to give you the tools to develop a Latin American business strategy and successful partnerships. Hear from top professionals from North and South America. Reserve your booth in the LatinComm Pavilion on the ITEXPO show floor.